At Kenberne's we've been fixing home appliances for Over 50 Years, so you know your in safe hands. 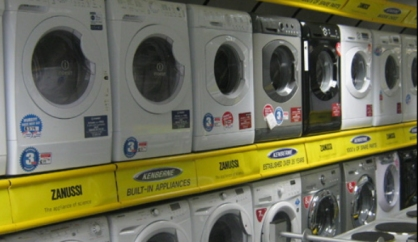 Fast repairs on all appliances such as Washing Machines, Tumble Dryers, Dishwashers and Electric Cookers. If you need your appliance fixing fast, we may even be able to call out today, so give us a call now to book your no fuss service call now. We fix all the big name brands such as Hotpoint, Bosch, Indesit, Hoover, Beko, Samsung, Whirlpool and many more. Is your cleaner not picking up like it used to? Chances are all it needs is a jolly good service, why not pop your cleaner down to 194 Sandringham road in Intake, Doncaster and we will bring your Vacuum Cleaner back to life. Service Includes New Belts (if applicable) and new filters. As well as servcing we also stock a huge range of home appliance spares, for all types of appliances, so if you need some carbon brushes, or a new door seal, we are sure to have the parts in stock. For more obsure parts, not in stock we can order them within a couple of days to get you back up and running in no time.